In April 2018 we created The Biggest Ultimate update for our web users. The Turn Off the Lights Options has a completely different user interface, that is simple and responsive in all screen size (desktop, tablet, and mobile). That you experience the YouTube experience even better. And with the support of the Dark Mode options page, so you see your settings in a not bright page. But a darker theme that makes it more comfortable for your eyes. May 2018, we remember the Global Accessibility Awareness Day, that disability users need a helpful tool, so they can experience the web in a less fearful way. In September 2018, it is Google birthday month but also to celebrate the 10th anniversary of the Google Chrome web browser. October 2018, the Apple Safari extension received the same engine update, with the Double Click menu to easily change the dark layer opacity. And to enable quickly the Night Mode feature (custom panel to choose your own background, text, and hyperlink color). November 2018, the American Education week, use this tool for special needs students. Here we highlighted a teacher review about the use of our Turn Off the Lights Chrome extension. And recommended you to use it too. In June 2018, we did the Big Ultimate update for the desktop users. The screen dimmer preference page has an Acrylic material theme. So it feels more together with the latest Windows 10 coherent and fluent design. 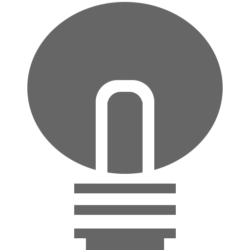 The Turn Off the Lights for Desktop app is the only unique and best screen dimmer for Windows 10 users. It is has a Responsive Layout, so the preference page match with your current open screen size. And easy to find your setting with the search box in the navigation bar. And you Turn Off the Lights for Desktop settings are saved in the cloud, so whenever you login in your Microsoft Surface or other Windows devices. You get the same experience on each device. The best and most powerful app to dims your screen on Windows 10. We would like to thank all our users, for his feedback, contributions, and support. It is always a pleasure to improve our work, and we are always here to make this small and free nifty browser extension better each update. That on your user request. Thank you and we wish you all a Merry Christmas and a Happy New Year 2019! In our previous post we talked about the 5 Pieces of Innovative Technology for Your Computer. And the virtual reality technology is one of them. Today we present you our new experiment, Aurora Player for VR. It is the next generation video player for your virtual headset, that show you a reality glow effect around the video content. You can try this WebVR app for free in your modern web browser. This app is built up with the WebVR API and with the same technology as in the most popular Turn Off the Lights Browser extension. You can play the demo video that is default loaded, but you can also choose your own video from your hard disk or phone memory SD card. Set VR headset on, and you ready to experience this virtual reality. 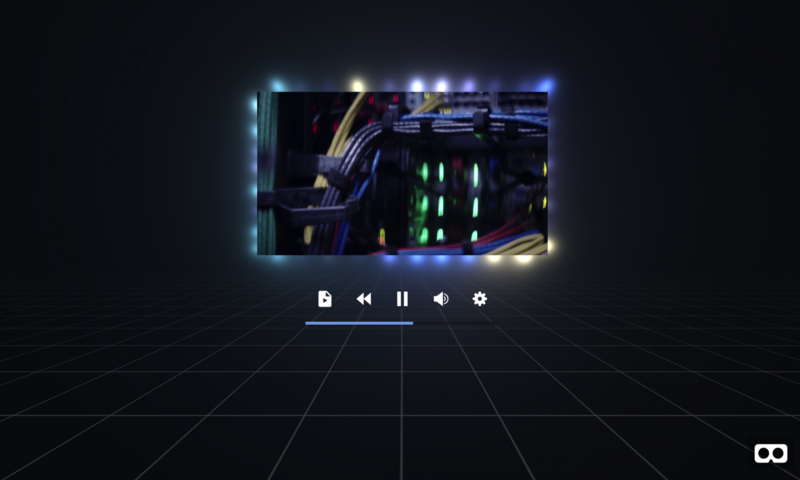 In this next generation video player app you can play it on your Google Cardboard, Daydream, Samsung Gear VR, Oculus Rift, HTC Vive and Windows Mixed Reality headsets. You can try yourself this free Aurora Player for VR on your modern web browser. This virtual reality technology is only supported on Google Chrome, Firefox, Opera and Microsoft Edge. And if you liked the new experience you as user can get it also on your personal computer. The app is available for Mac and Windows users. In this virtual world you can play your own favorite videos and movies. And you can also customize the background to your own style. Such as the color black, gray, white, purple, red, yellow, blue and green. 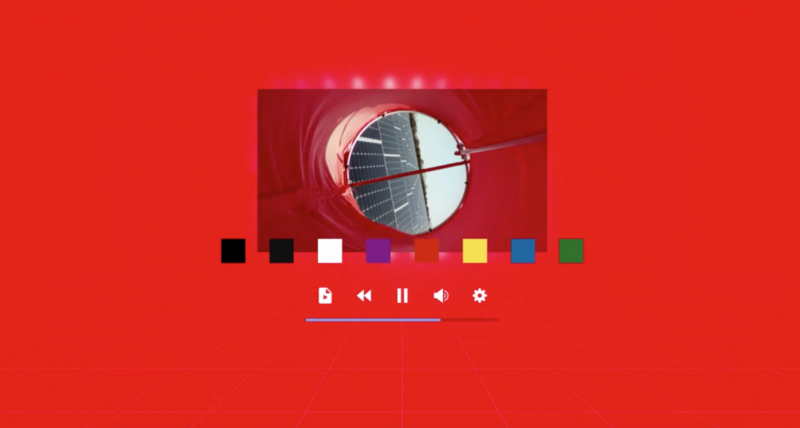 We hope you like this new WebVR project, and experience yourself a beautiful way to enjoy your own videos in the VR headset. And you can always feedback us on the official support page of Aurora Player. Telling is faster than writing. 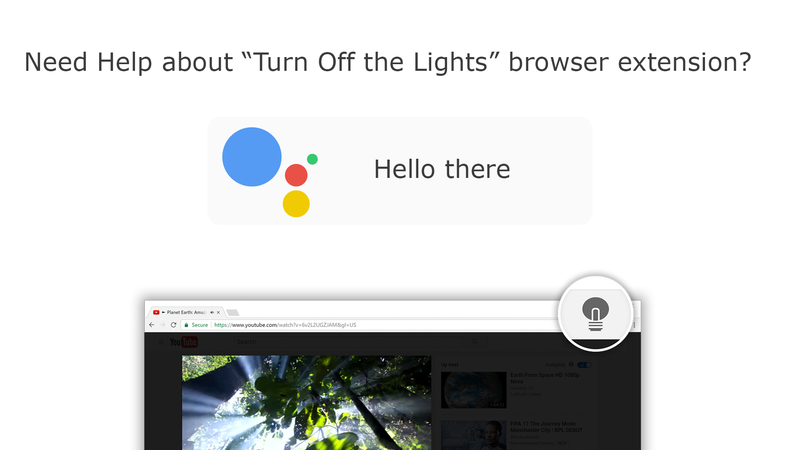 And we are happy to announce that you get fast support about all our Turn Off the Lights products, thanks to the Google Assistant (in Google Home, Phones and Allo). You can ask any questions you have about “Turn Off the Lights” software. And each time the personal assistant will become better and better when you use the app. Now you can say everything you want, and we will receive your message in a text. However, we cannot reply to your personal message. But if you want to get a reply from us, then you can provide us your email address in your audio message. We take the privacy very seriously, and we do not collect any personal information unless you provide it to us (such as an email). This Google Assistant app does not need you to sign in in our website.